EastPointe is a private psychiatric hospital that also operates involuntary and residential units. Referrals for admission are not required and many patients are self-referred. However, we do accept referrals from a variety of settings including other hospitals and hospital emergency departments, and outpatient settings, such as from therapists or physicians in private practice. Patients admitted voluntarily will have called CarePointe, AltaPointe’s access-to-care call center that conducts assessments over the telephone and manages admissions and referrals. CarePointe also reviews insurance and billing procedures. EastPointe accepts all major insurance carriers and Medicare. Though based in the Mobile Bay region of Alabama, our patients may reside in other cities, counties and states. The average length of stay on this unit is seven to nine days. Patients involuntarily admitted are evaluated by our professional staff members who make recommendations to the probate courts of Mobile, Baldwin or Washington counties in south Alabama regarding the patient’s need for commitment or treatment in a less restrictive setting. The average length of stay on this unit is 14 to 20 days. Each patient completes a psychiatric diagnostic evaluation and receives 24-hour clinical care. The goal is for each patient to return home or to the least restrictive level of care as quickly as possible and to follow a comprehensive aftercare plan upon discharge. EastPointe’s treatment team comprises patients, psychiatrists, nurses, therapists, recreational therapists, psychiatric residents, certified nursing assistants and behavioral staff. Our approach to care includes family members or other supportive individuals. Family therapy and meetings with physicians are available at the request of the patient, family member or treatment team. EastPointe professionals believe strongly in care coordination, which is why we consult primary care physicians, as indicated. Psychiatrists assess and evaluate each patient daily, which includes managing each patient’s medications. Individual, group and recreational therapies help patients gain insight into their illnesses. 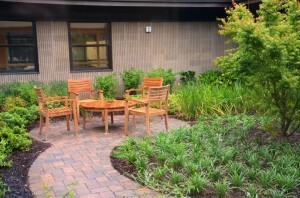 The hospital offers secure outdoor areas where patients may spend leisure time or where therapy sessions are sometimes held. All patient rooms are semi-private. AltaPointe’s attractive and high-tech EastPointe Hospital erases institutional stereotypes typically related to psychiatric facilities. Calming colors and patterns, engaging artwork and aesthetically appealing furnishings work together to promote a non-institutional feeling throughout the building. Planning for discharge begins early in the treatment process. From the time of admission and after each interaction, our healthcare professionals work with the patient to ensure supportive services are in place prior to discharge. This may include medication monitoring, therapy, and substance use treatment. Patients are referred for follow-up to their referring provider at discharge, or they may be referred to another private provider.